Looking a bit bemused the girl with her bucket and spade wonders where the sand has gone - while the girl in front has a little paddle. 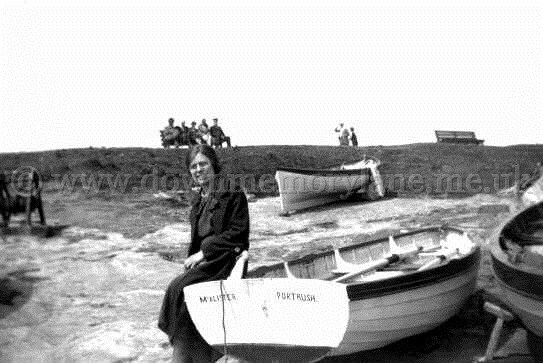 Sadly she doesn't know the tide is in as you can see by the landing stage fence at Portrush - her name and the year is unknown. 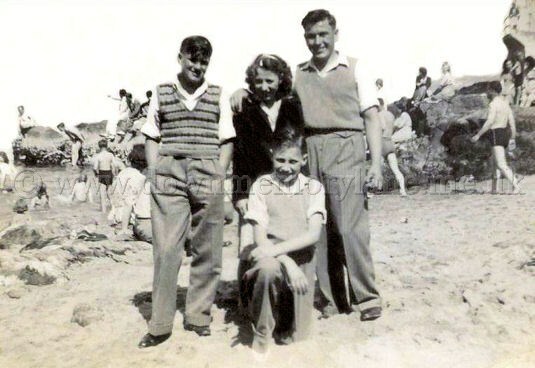 Enjoying a day out at Portrush in 1958 we have the Reade family. 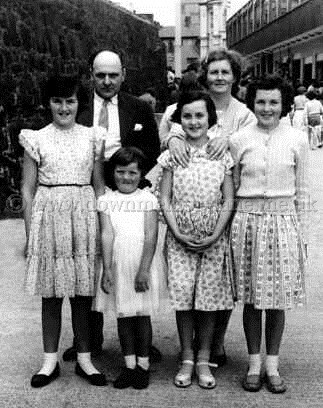 Mum - dad who were Ester and Tom Reade, then all smiles in front are Lena, Bessie, Ester and Evelyn. Did you noticed that most Antrim folk ha ve had their photo taken in nearly the same spot it must have been a favourite place for the street photographer. 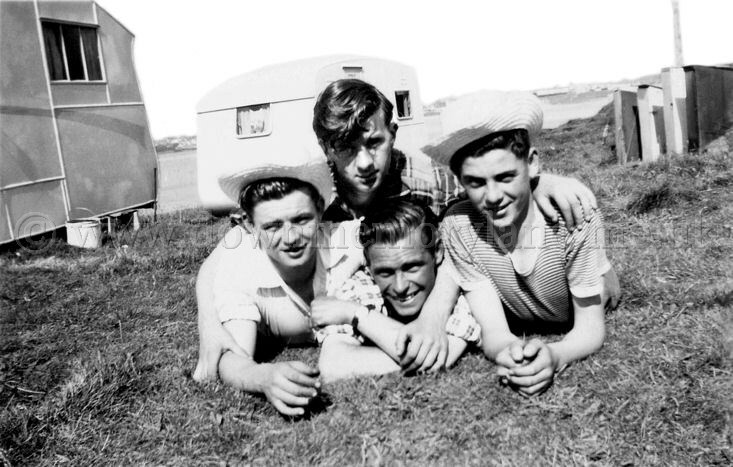 Out for the day at Portrush in 1949 these lads from Antrim are hoping to click! On the left is Thompson Clarke, Hugh Adams, Jim Esler and Jim Wilson. It's Portrush beach in August 1971 and as usual there's plenty of people here. Now spending a holiday away from Antrim we have Linda Scott with her Flower Power mum Eleanor enjoying themselves while Dad takes the photo. Here we have Maggie Hannan from Antrim taking a rest on the beach at Portrush. With this photograph no one has to guess were it was taken for I think everyone has been photographed in this exact spot. 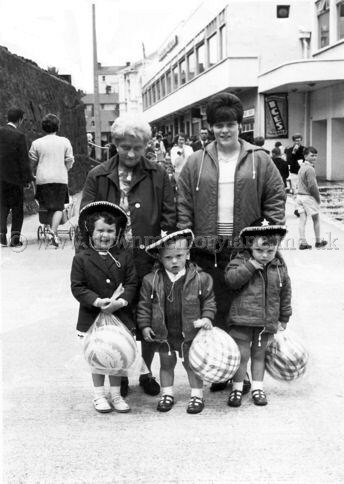 Of course it's Portrush in 1966 and every child must get a cowboy hat and ball at least that's what Sharon McQuillan along with Norman and Gary Hannan think. Behind them is Elizabeth McQuillan and sporting a Beehive hairdo is May Hannan. Portrush! a name that then in 1959 and even today still fills kids with excitement. 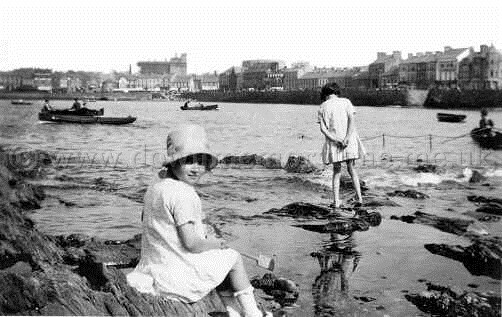 Seen here with her back to you is Marie Wallace searching for anything in a rock pool and jumping with excitemnet when you found something. Taking her photograph is her mother Josephine Wallace with a Kodak bellows camera. It used a roll film which you wound on after taking a photo, on the back of the camera was a small round red couloured disc. This let you see the number of the photo, they used to take either 12 or 24 exposures. When you had finished the number of photos on the roll you wound on untill the end. Then you opened the back of the camera and gently lifted out the roll of film then licked the sticky strip and sealed the roll to leave in the chemists to be developed and printed. 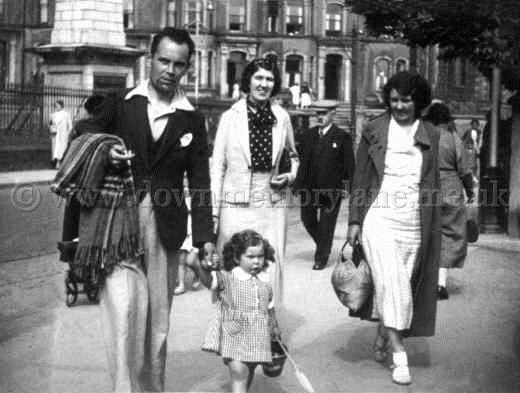 Heading for the beach at Portrush in 1936 is Joan McElrea, holding her hand is her daddy Jack McElrea. Beside her is her mummy Agnes McElrea all from Antrim. 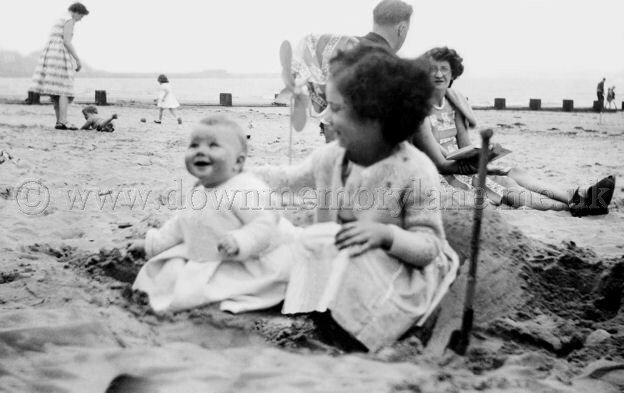 Here's Miss Joan McElrea enjoying a day on the beach at Portrush in 1936. 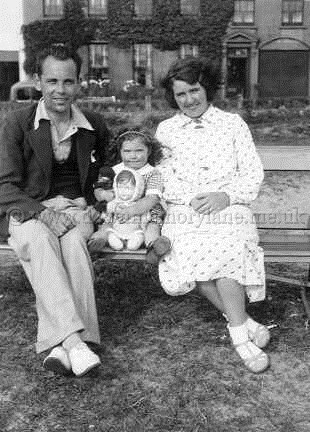 Joan has brought with her from Antrim her mum Agnes and her Daddy Jack McElrea. 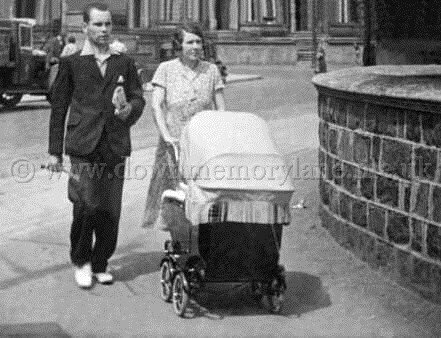 This Jack and Agnes McElrea, in the pram Joan McElrea from Antrim enjoying a walk round Portrush in 1935. 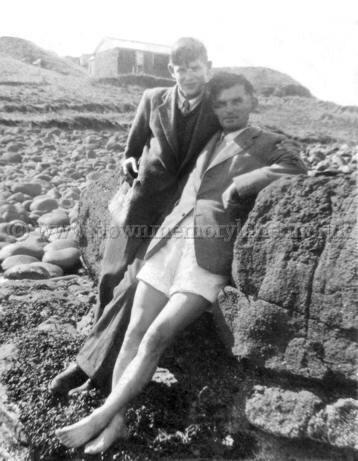 Take a look at Jack's shoes, quite a dresser back then. The van by the way in the background is collecting for Monarch Laundry . 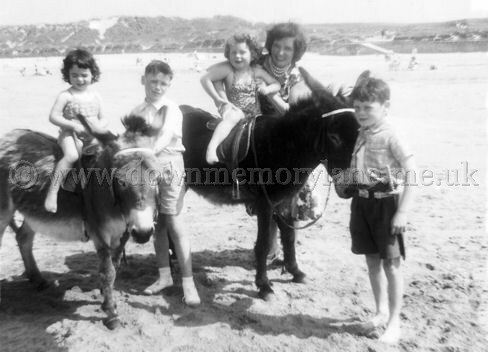 Portrush on the Strand in 1959 was a wonderful place to be at least that what Marie Wallace thought as she was being helped onto the donkey by her mum Josephine Wallace. On the other donkey is Paula a relative over on holiday from Scotland, the two boys were minding the donkeys. 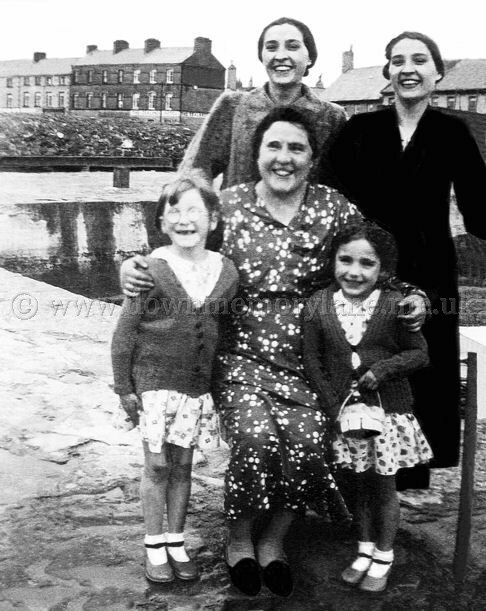 Portrush 1936 and seated on the bench proudly showing off her two dolls is Joan McElrea from Antrim. 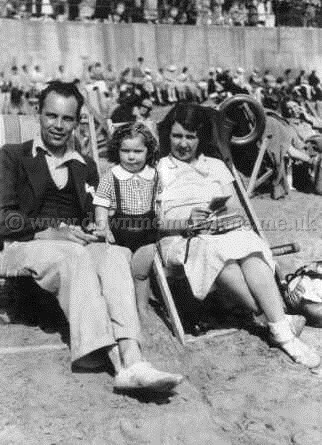 Either side of her is her Mummy and Daddy, Jack and Agnes who Joan took on holiday with her. 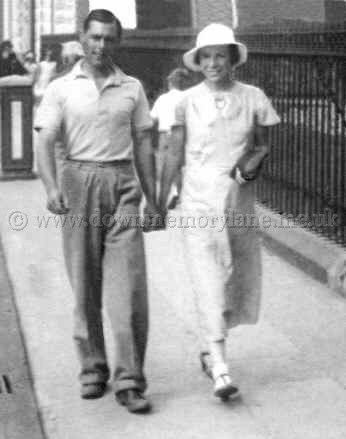 Here we have Jock and Sadie Bain from Antrim at Portrush in July 1934, still like honeymooners holding hands and looking so happy 21 months after getting married. Perhaps they know something we don't ! 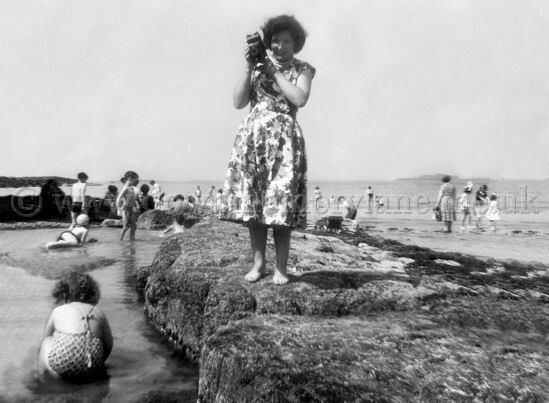 Sitting beside a rock pool at Portrush in June 1959 in Josephine Wallace. Standing giving a cheeky grin to the camera is Josephine's daughter Marie. The other little girl is Paula from Scotland who was staying with them. we have Unknown, May Stewart, Unknown and Unknown. In the background you can see the Arcadia Cafe. 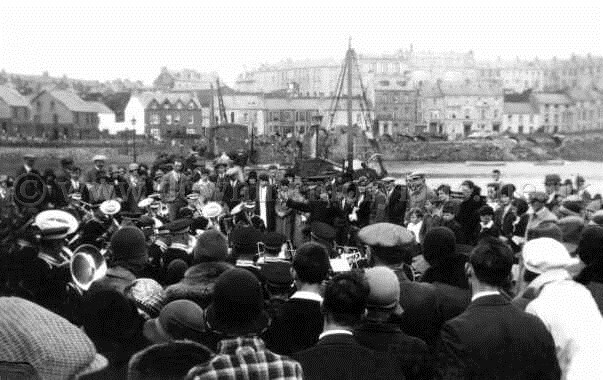 Here on the front of the harbour at Portrush in 1908 during the Easter break the crowds are listening to the Massereene Brass and Reed Band playing a selection of tunes. The crowds loved it and usually joined in with the popular tunes. 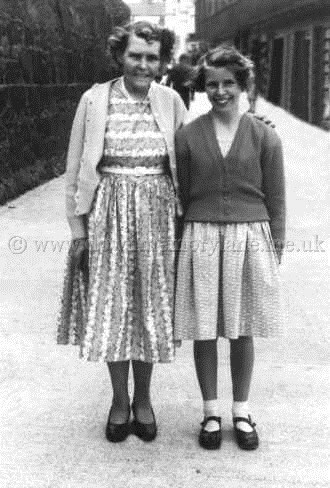 Out for the day with her mum Jean Millar we have Eleanor Millar in Portrush in 1961. They were getting their " Walkie Snap " taken at the most popular spot there. If you like the photo you could always order more from Grimason's in Portrush, you could get 3 for 5/- plus 3d postage. 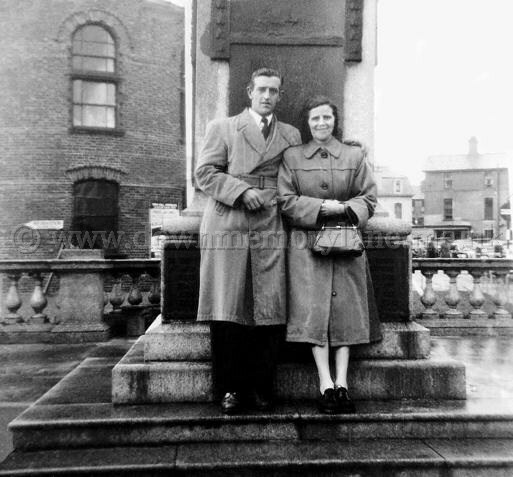 Standing in front of the War memorial in Portrush is Jim Young and Matilda Blair. The brick building behind them was the theatre. 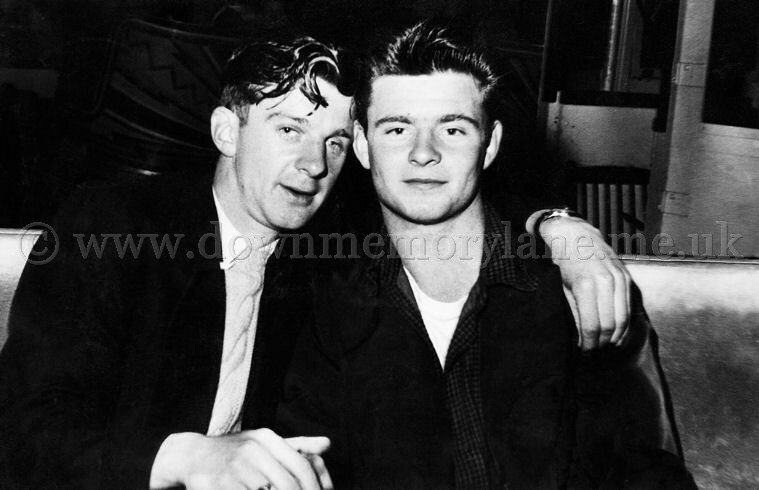 Just round the headland from Portrush we have on the left Joe Young with a friend who is unknown. 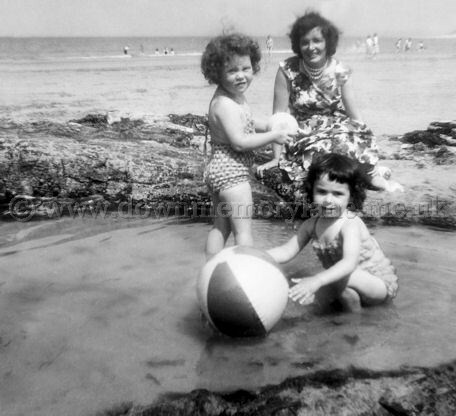 Like everyone else that day in August 1948 enjoying a day on the East Strand beach at Portrush, which was known as the "Ladies Bathing Place" in the 1930's when mixed bathing was not allowed and further round was the "Blue Pool" area where the men bathed. In the top right hand corner you can see a man and the building behind him was the Arcadia Ballroom. All the way from Antrim are John Hannon, Muriel White nee Rae with her husband Hugh White and kneeling in front of them George Clarke. 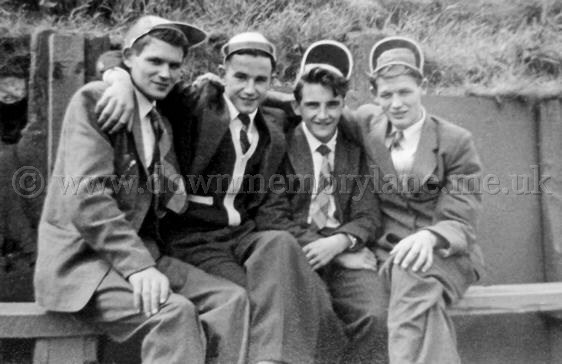 It's 1956 and Elvis is No1 with Hound dog and these lads with their brylcream hair slicked back. A cert to wow the girls here at Portrush. Now these heartbreakers are Noel McKee, Georgie Brown, Jimmy Patterson and Norman McCaig. 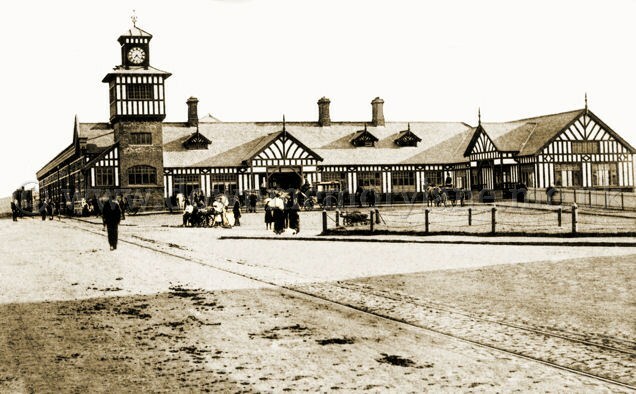 Here we are outside Portrush railway station at nearly 7.25 in the morning in the early 1900's and yet there a number of people about. In the foreground is a man with his back to us walking towards the station, he carring a lamp so perhaps he is a railway guard. To the right of him are a group of people, one is a lady with a white blouse and long skirt. Perhaps she's a mother for the other three are young girls, two with long skirts and one with a knee length skirt. Across from them is a flat topped cart with objects on it and leaning against one end of it is a young boy. At the other end is a well to-do lady looking at what is on the cart hoping for a bargain. Standing in front of her is her young daughter, in her arms is a baby while father looks on. Over to the far right at the station waiting is a driver with two horses and an open carriage. Moving to your left to the entrance there is another driver with a carriage this time and next to him is a Jaunting car. On the corner is a lady with a white shawl over her and holding on to a little girl. The tracks which you see ran right through the centre of the town and was for the Giant's Causeway passenger train. 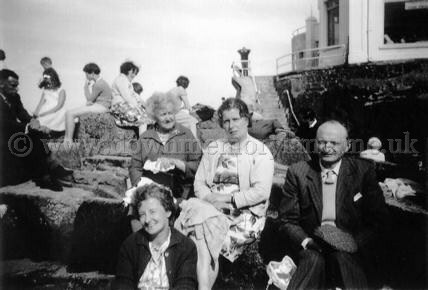 This family out enjoying themselves for the day at Portrush are at the moment all unknown. Here we are in Barry's amusements in Portrush back in 1957. Seated here waiting on the rest of their friends are Jimmy Patterson and Norman McCaig. 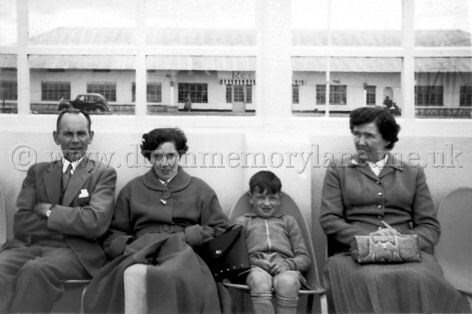 Seated on the promenade are the McDonald family from Antrim in 1965. On the left is dad Robert, in his arms is Alan, next is David enjoying an ice lolly and holding on to his World Cup football. 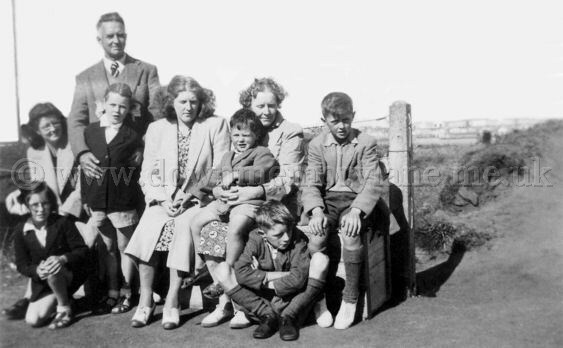 Beside him is his mum Ina and sitting on her knee is young William, at her feet is the usual gear a mum brings, a holdall with spare clothes and food. 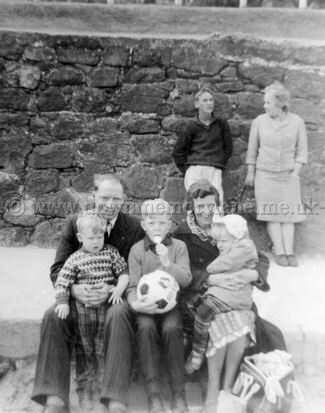 Out for the day at Portrush on the 9th August 1948 we have standing at the back William Blackbourne, in front are Peggy, Doris Blackbourne, Aunt Amie, Annie Blackbourne, on her lap is young Terry and then Cedric Blackbourne. Kneeling down are Marnie Blackbourne and Liam Blackbourne. Right Mummy where is all the sand? 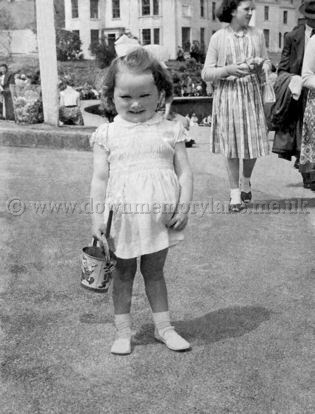 is what 3 year Moreen McNally seems to saying as she stands there with her bucket and spade in Portrush in 1959. Could Moreen have been on a 'Sunday School Outing? the clue could be the girl behind her carrying an Apple and two paper packed lunches. Out for the day and certainly enjoying themselves in Portrush. 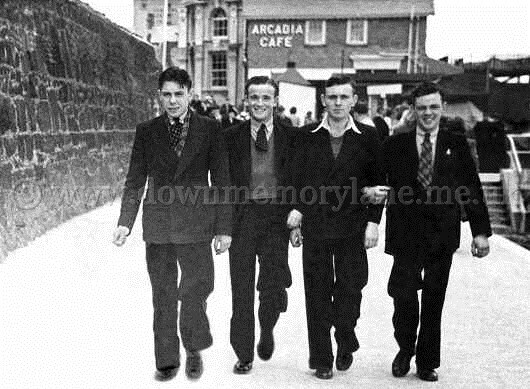 We have from the left Joe Young, Dessy Gaynor, Johnny Beck and Norman Young. This is a sight you don't see on the sands at Portrush now but back in 1977 they were. 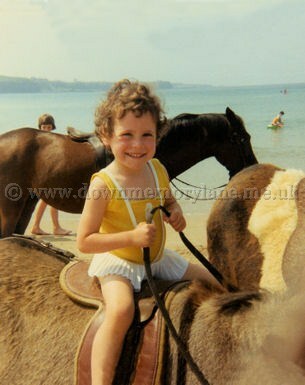 Taking advantage then and having a ride on the donkeys is young Suzanne Fleming. 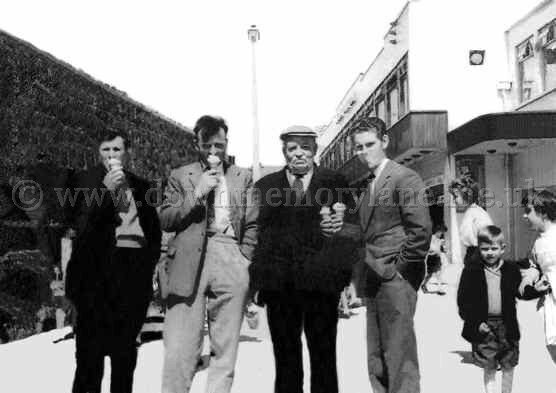 Enjoying their ice creams and a day out at Portrush in 1955 are from the left Sammy McDowell, William McClenaghan, David Keroghan and Jack Coulter. Jack's face is not covered in ice cream, the photograph was in a bad state. 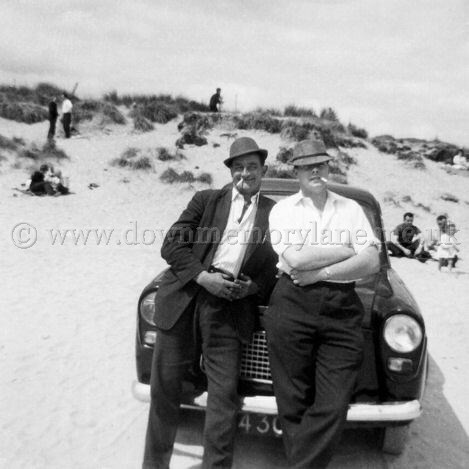 David Kernoghan with cap was known locally as 'The Big Man' and you were always welcome in his house for a cup of tea. Now if David boiled you an egg to go with your tea you had to leave thrupence on the table before you left! They had come with the Eskylane Sabbath School excursion and would have caught the train at Cookstown Junction. 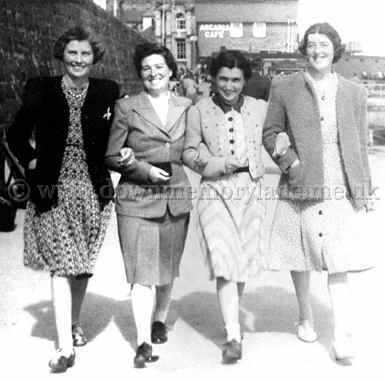 Here we have Jack McElrea, Alice Nicholl, Irvine Nicholl and Agnes McElrea in Portrush on what looks to be a very cold day, though that could be any time of the year. 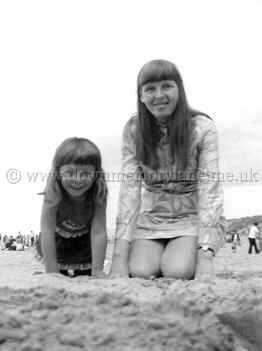 Sitting on the sands of the Strand at Portrush in the foreground we have Anne and Gillian Butterfield. Behind them is a couple relaxing and the lady is reading a book. Over to the left is a mother looking down at her son who has just fallen while the daughter is playing with her ball. On the shoreline is a father with two sons having a paddle. 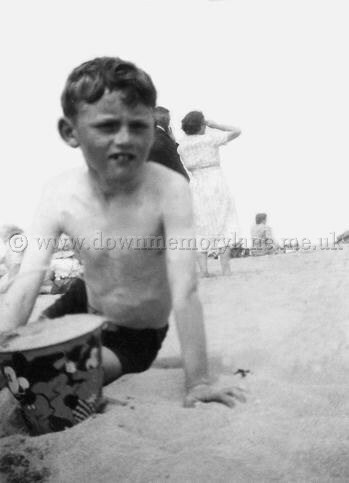 It's Portrush in July and Harold Young is just getting ready to make a sand castle with his Mickymouse sand bucket. In the background seated is a mum getting the picnic ready for her hungry youngsters to eat. Having a bit of a rest on the rocks on the right is Ivan Gillespie while up in Portrush for the day, behind them is the Arcadia Ballroom.